SoapBoxLA: Breakin' the law and proud of it! Breakin' the law and proud of it! One would think that those about to break the law would be discrete about it, but when law enforcement and municipal authorities get busy abusing rules and violating rights, some of them do it with bravado and confidence, announcing their actions with confidence. The City of Los Angeles recently released a flyer and an accompanying email that informs the public "No bicyclists allowed within the construction zone along PCH" which violates the California Vehicle Code and the Caltrans standard for access and accommodation. It is incumbent on the City of LA to provide for all modes and taking one group off the street is not a solution, no matter how well-intentioned. It demonstrates that those in charge are either cavalier or uninformed. Either way, it's not only illegal, it's unsafe and the variable K-Rail traffic plan is a tragedy waiting to happen. The City of Malibu takes a different approach to breaking the law, allowing the Los Angeles County Sheriff's Department (LASD), which is responsible for PCH through the City of Malibu, to enforce laws that don't exist. In response to a complaint that cyclists were not riding single file (not required to, no such law) the LASD incorrectly advised the City Manager that riding side-by-side was illegal. In response to a complaint that cyclists weren't riding on the shoulder (not required to, no such law) the LASD incorrectly advised the City Manager that cyclists are required to use the shoulder when one exists. This novel approach to law enforcement has further exacerbated an already tense environment by adding confusion and misinformation to the mix. The City of Santa Monica has a unique style for breaking the law, taking valid laws and then cranking them up to the point of absurdity. Santa Monica, as permitted by state law, cites cyclists for not having bike licenses. But then Santa Monica goes on to exceed their authority by requiring anyone riding through the city to obtain a permit (state law limits bike license requirements to residents) and then applies a penalty that exceeds the state mandated $10 maximum with a threat of six months in jail and/or up to $1,000 in fines. The City of Thousand Oaks finds California Vehicle Code very confusing and gets highways and roadways mixed up, applying both inappropriate and fictional standards to cyclists who ride bikes "the wrong way" on sidewalks, explaining that cyclists must ride to the right of vehicular traffic traveling in the same direction. (sidewalks are non-directional) The penalty for this offense is $180. 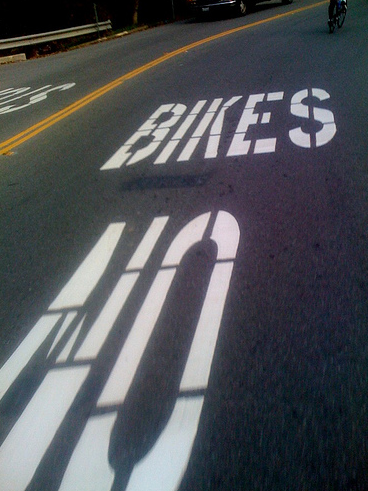 The City of Los Altos Hills is one of the proudest offenders, they actually took paint to the street and wrote "No Bikes" in very large letters on El Monte Road, a popular cycling route. To their credit, Los Altos Hills quickly reversed their ways and removed all the offending paint, disappointing the cyclist who pointed out that simply removing the "NO" would leave a nice affirmative on the streets. The City of Pasadena chose the public hearing process as the venue of choice for their assault on the law, scheduling not one but two readings of their proposed restriction on cyclists, all as a result of congestion and conflict at the Rose Bowl. Invoking the non-existent rights of a municipality to restrict cyclists from riding side-by-side, the City Council twice weathered the storm of public outrage that ran into the late night hours before conceding defeat. The City of Burbank adds a stern touch to the Chandler Bikeway with their "Walk Bike" signage at crossings, enforcing a non-existent law with white rectangular regulatory authority. While their stated intention is "safety" for the cyclists, perhaps it would be safer for all concerned if the motorists were instructed to exit their vehicles and push them through the intersection. 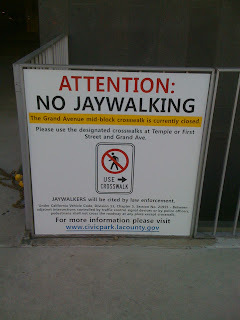 Meanwhile, the conflict on the Chandler Bikeway can be found...on the path. 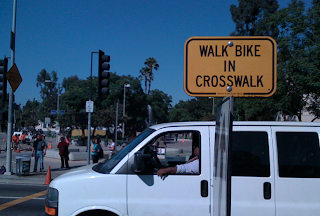 The City of Los Angeles took note of Burbank's misuse of regulatory signage and ordered yellow advisory "Walk Bike in Crosswalk" signage that they posted on Jefferson Avenue outside USC, apparently in an effort to support the estimated 15,000 cyclists who ride to school. While good advice is always appreciated, this advice is hardly good and it comes with the threat of a $250 ticket for violating a warning! The LADOT installed the signs and the LAPD supported the effort by working with USC's Department of Public Safety to enforce the mythological law. This dubious partnership has resulted in an empowered DPS which now operates with an inflated perception of their legal authority, to the dismay of those who know the law. 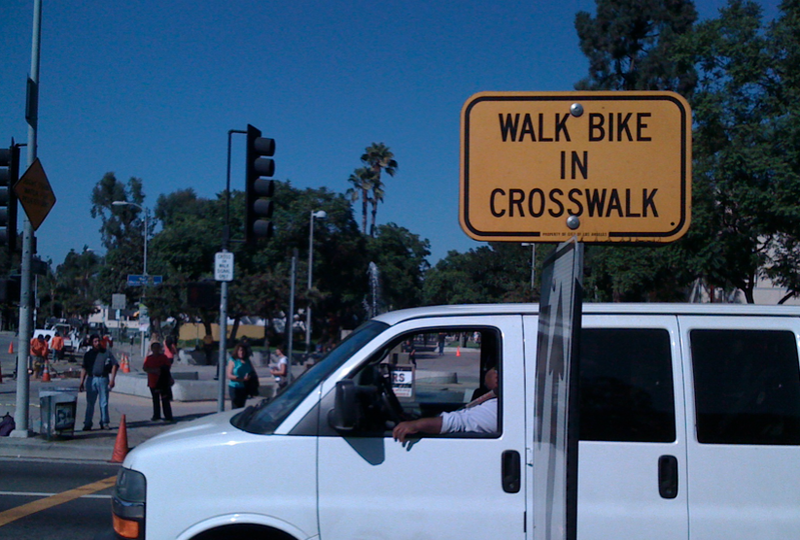 The City of Los Angeles is no stranger to the controversy over cyclists riding in the crosswalk. Last year a cyclist rode across the street in a crosswalk in a residential community, only to be struck by a right turning DWP truck and killed. The LAPD determined that the cyclist was the "primary cause" of the incident because "she was riding a bike in a crosswalk in violation of CVC 21200 which requires a cyclist to obey the rules of the road." the LAPD PIO went on to explain that "Cyclists must either dismount at crosswalks or ride on the right side of the road with traffic." The City Attorney's office continues to support this position, even when contradicted by CVC 21650. Meanwhile, the City of LA and the Metro continue to build bike paths such as the Orange Line that take cyclists across intersections in crosswalks. 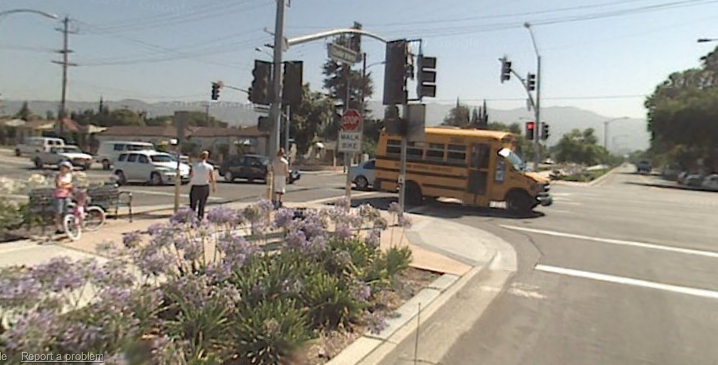 The City of Los Angeles is in good company when it comes to misunderstanding crosswalks. Conor Lynch was recently killed while crossing the street midblock. The LAPD was quoted by the LA Times in pointing out that Conor was not crossing the street in a crosswalk. 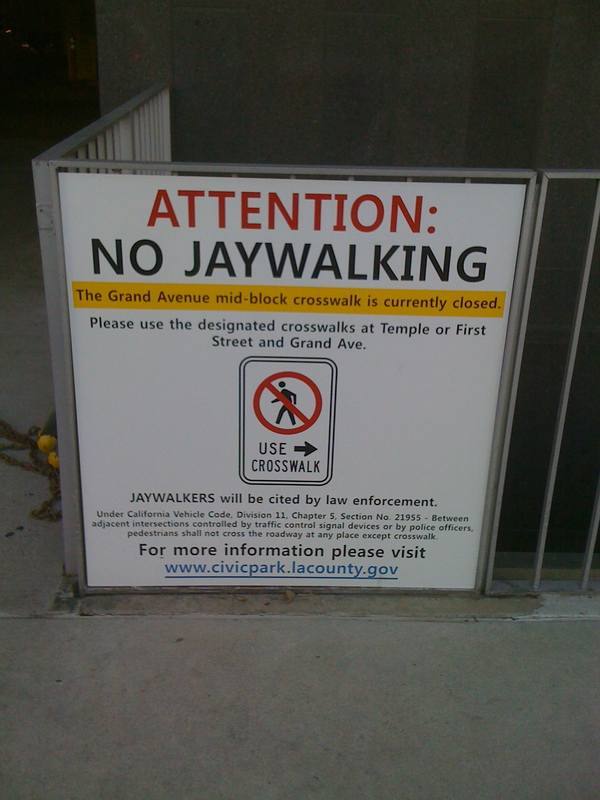 This may have been true, but it reflects a misconception that midblock crossings are "jaywalking" violations but they're not. Streets are for crossing unless between adjacent intersections controlled by traffic signal devices or law enforcement. The City of Long Beach went beyond inappropriate flyers and signage, selecting YouTube as the appropriate venue for a demonstration of their creative law enforcement strategies. Some might cringe when hearing the LBPD Officer state "You know what, because you’re argumentative, I’m gonna give you another ticket. And then you can fight two tickets." A punitive ticket, clearly explained by the offending law enforcement officer! The LBPD officer sets the tone for the interaction by informing the cyclist "You were impeding my traffic." In doing so he clearly demonstrates a lack of understanding of CVC 21656 "On a two-lane highway...a slow-moving vehicle...behind which five or more vehicles are formed in line, shall turn off the roadway at the nearest place designated as a turnout by signs erected by the authority having jurisdiction over the highway..."
The LBPD officer goes on to misquote the law, telling the cyclist that the California Vehicle Code says "‘bicyclists must ride to the right side of the road." It doesn't. CVC 21654 says "...any vehicle proceeding upon a highway at a speed less than the normal speed of traffic moving in the same direction at such time shall be driven in the right-hand lane for traffic or as close as practicable to the right-hand edge or curb... "Or" is a mighty big word. Cyclists in the LA Area are acutely aware that the legal landscape is quite uneven. Different agencies, authorities, and departments vary greatly in their interpretation of the law and their enforcement strategies. LA County is home to 88 municipalities and the number of different law enforcement authorities is quite large. Within the City of Los Angeles, a cyclist may encounter officers from departments that include CHP Troopers, State Park Rangers, County Sheriffs, Harbor Police Airport Police, School Police, Library Police, General Services Police, City Park Rangers, and of course, the Los Angeles Police Department. Collectively, they enforce the law. Individually, they operate according to their own priorities and interpretations. 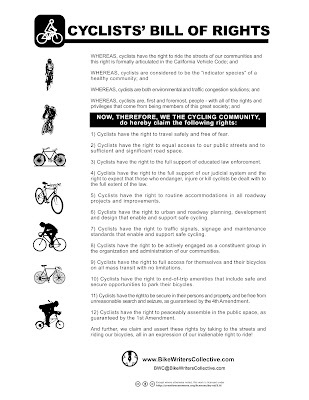 This is why the cyclists of LA need the Cyclists' Bill of Rights, a document that starts the conversation affirmatively, with a foundation of rights that are already codified in the constitution, the CVC, departmental directives, policies, and municipal codes. Non-Trivial: How exhaustive a search was done for these examples? It strikes me that all but one are SoCal. If search was exhaustive, then this is indirectly a comment on SoCal culture. If search NOT exhaustive, then perhaps not! OK - now a third point: No picture for the "visual verification" to submit comments! I'm in northern California (Santa Cruz, specifically, so more like Central Coast), and I know of a couple more minor examples in the SF Bay Area, but nothing egregious like those listed here. The Los Altos Hills situation -- an active cycling community brought this *immediately* to the city's attention. It's a small city, and in this case the city engineer was unfamiliar with state law regarding bike access, so we took the opportunity to educate him kindly on the points of law. 1) LA City engineers have been informed of the illegality of banning bikes through the construction zone. The project manager has agreed to meet with a few of us to accommodate bikes through the area. They stated in no uncertain terms that they are not banning bikes, despite the flyer to the contrary, and will not issue tickets to cyclists continuing to ride through the construction zone. We will clarify the appropriate warning signage and lane closure procedures to maintain bike access. 2) The City of Malibu and LASD have been working with cyclists over the past few months to clarify the CVC. The cyclists involved with this are fully committed to vehicular cycling and taking the lane whenever appropriate. The City is coming around slowly and the Sheriff Department is working on getting LAPD's new training materials for their officers. Of course it would be better if we never had to deal with well-intentioned, but misinformed people. But fortunately, most well-intentioned people end up doing the right thing after a little education. Biking side-by-side: For all intents and purposes, cvc21202 disallows unless moving as fast as other road traffic. Biking on the sidewalk/ across crosswalks: This one is arguable. That means that you leave your fate in the hands of the judge. Better hope that he/she likes your face/attitude. CVC21650 doesn’t contradict the city attorney’s statements with regard to the death of the biker you cited for a couple of reasons. 1) the ordinance in effect on the date of the bikers death didn’t include any statements to the effect of bicycles in crosswalks and 2) After Jan 1, 2010, CVC 21650 allows for bicycle operation in crosswalks only where it is not otherwise prohibited by local code, as addressed in LA by LA MC sec 56.15. Law aside, biking through crosswalks is just plain dumb- ask the truck lady who came out the loser on that one. The incidents were opportunistic, not the result of an "exhaustive search." The flyer was sent to me, the USC and Burbank signs i encountered while on the road, etc. While the LASD waits for the LAPD training materials, the City of Malibu has communication from Caltrans that is specific on the laws regulating cyclists, including the lack of a prohibition against side-by-side cycling. It's a good letter, from the Caltrans 7 Director. One would think that would suffice. There is no "single-file rule" in the California Vehicle Code (CVC) and cyclists share the lane with the operators of buses, trucks, passenger vehicles, motorcycles, and even other cyclists. The "ride to the right" mythology is based on the assumption that lane control is not an element of "practicable." I agree with you that sidewalk cycling is dangerous and risky, for many reasons. Nevertheless, the crosswalks are part of the sidewalk, and if sidewalk cycling is permitted, so is crosswalk cycling. Also, they are both non-directional. “Sidewalk” shall mean any surface provided for the exclusive use of pedestrians. Pedestrian signal heads are designed for controlling pedestrian traffic: Section 4E.01 of the MUTCD "...Pedestrian signal heads provide special types of traffic signal indications exclusively intended for controlling pedestrian traffic..."
Crosswalks are extensions of sidewalks: CVC 275 "Crosswalk" is either: (a) That portion of a roadway included within the prolongation or connection of the boundary lines of sidewalks at intersection where the intersecting roadways meet at approximately right angles, except the prolongation of such lines from an alley across a street. (b) Any portion of a roadway distinctly indicated for pedestrian crossing by lines or other markings on the surface. Local Municipalities are prohibited from restricting cyclists unless expressly permitted: CVC 21, Uniformity of Code "Except as otherwise expressly permitted, the provisions of this code are applicable and uniform throughout the State and in all counties and municipalities therein, and no local authority shall enact or enforce any ordinance on the matters on covered by this code unless expressly authorized herein. Local Municipalities may restrict cyclists from sidewalks: CVC 21100 (h) Local authorities my adopt rules and regulations by ordinance or resolution regarding the following matters. (h) Operation of bicycles...on the public sidewalks. Sidewalks, ped traffic controls, crosswalks, and all of the other elements go together and if cyclists are permitted to use the sidewalks, they are permitted to use the crosswalks and follow the traffic control devices that control traffic on the sidewalks and crosswalks. If the crosswalks are not part of the sidewalk, prohibiting cyclists from using them will need to be expressly articulated in the CVC, as required by CVC 21, the Uniformity Code. Bob Mionske referred to Los Angeles in his column last year, giving some national exposure to the unresolved range of opinions in LA on how a sidewalk/crosswalk is to be used by cyclists. From the LAPD, to the LADOT to the City Attorney, we should be able to get it together. A very useful post that puts into broader perspective the need to find agreement across local policies that govern cycling and coordinate them with state law. As the many examples here suggest, it's a lot to keep in mind when riding across town may take the cyclist though four or five jurisdictions. Moreover, the confusion between state and local codes puts the cyclists (always) at a disadvantage in case of a traffic stop. With regard to USC, these folks just can't get it right. A months-long series of requests to urge campus Dept. of Public Safety to communicate to students (many international) the law against riding against traffic went nowhere. Even though it was clearly proscribed by law, and even though it was a flagrant violation and often citied by LAPD officers. Again, great post that prompts two ideas: a bill or rights hangtag for bikes; and a first cut at trying to aggregate info about local regulations so that we can track them and gauge progress on change. 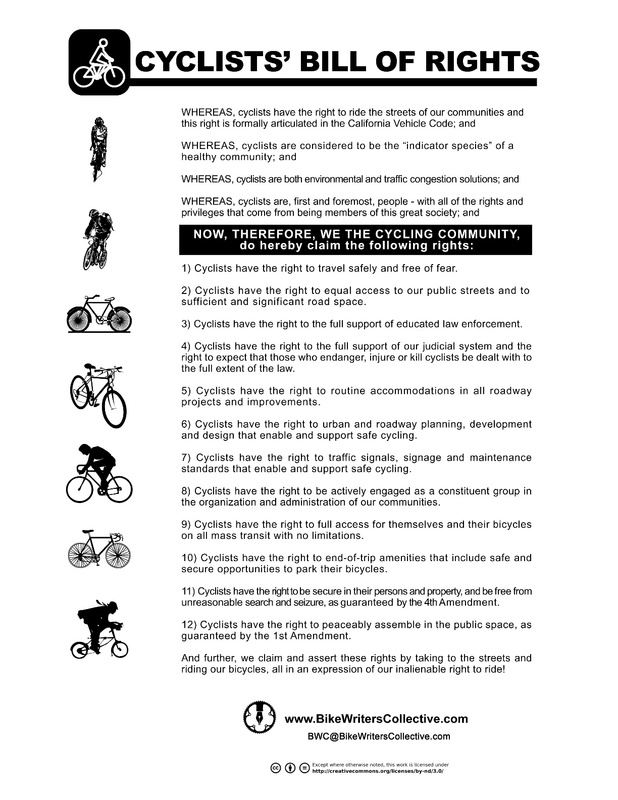 The Cyclists Bill of Rights is of great value, and might well be supplemented by a bike hang tag, sponsored, say, by the LACBC, another nonprofit, or perhaps local clubs or shops. This could be both a brand-builder and a useful takeaway for riders. On one side, an abbreviated Cyclists Bill of Rights communicates the state law; on the other, local regulations that are often bedeviling to cyclists are explained. The card would be distributed within the locality (I park at Traders in Hollywood and I return to my bike to find a City of LA version). The bottom rights statement would be detachable from the top half, which could be the branding, membership, or sponsorship info. Then there is campus-by-campus regulations that also relate to access and operations. From an aggregated sample we could identify egregious no-nos and develop a best practice list of value when we contact individual campuses.